Zinc is pretty new, so it doesn’t work with every retailer out there just yet. Currently you’ll see discounts on Amazon, Walmart, Macy’s, and Target. When you go to check out, a big blue speech box (pictured above) will show you your savings for that order. Generally you’ll save between $ 1 and $ 5, but it can be more for larger orders. While this isn’t a huge amount of money, you don’t have to do any work for it. 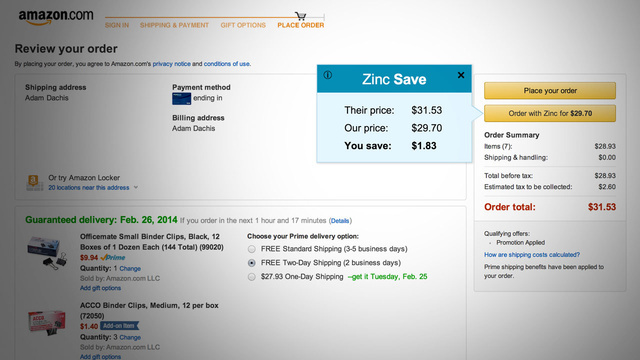 You just pay through Zinc instead of the retailer and they take care of everything for you—even Prime shipping if you’re a member with Amazon. You’re probably wondering about security. Zinc uses Stripe to handle payments, which is the processor for a lot of sites like Reddit, Hipmunk, and Foursquare. Your sensitive info is securely held with them. If you have other concerns before signing up, send them an email and ask a question. If you want to check it out, just download the extension through their web site and buy something on a supported retailer’s site.